This is relevant to process industries such as Pharmaceutical and Chemical companies that require a support of potency management and Batch Balancing during production. A formula may consist of active, compensating and filler ingredients. 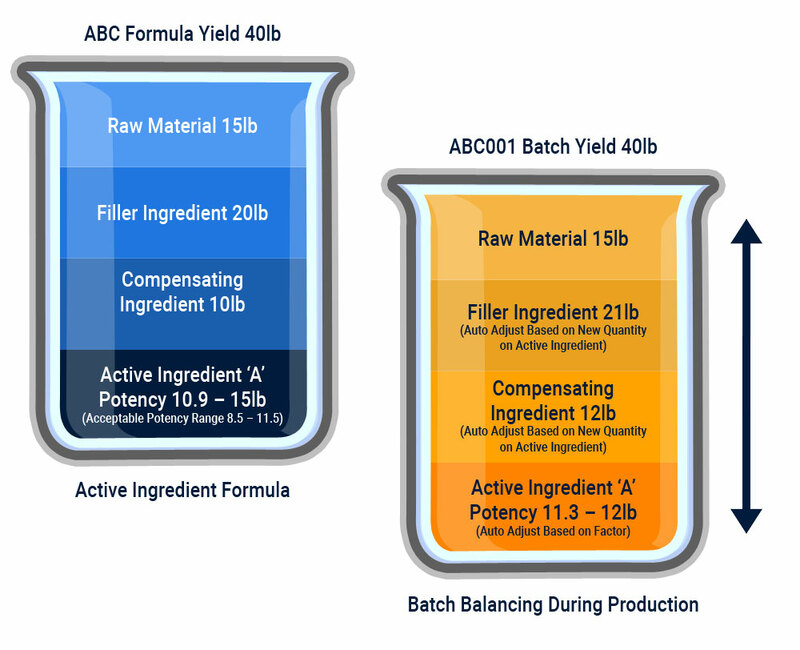 Batch Balancing calculates the amount of each ingredient required to produce the product for a specific batch based on the potency value selected for the active ingredient. The amount of active ingredient will vary based on the target value for these products and the purchase price / sales price will often vary based on this value. You may receive active ingredients at a specific potency that lie within a specific minimum and maximum tolerance range. If your formula includes active ingredients without a way to automatically adjust the quantities to meet the specific potency, it could be a nightmare to auto adjust the consumption quantities of the ingredients. You may have a compensating or a filler ingredient that needs to be adjusted based on the potency of the active ingredient. Every time a higher potency batch is selected for the active ingredient, the quantity required to be consumed on the production of a batch may reduce from the standard value and the compensating ingredients need to be adjusted to a higher quantity to yield the same amount of finished product. Now imagine, doing this mathematically every single time in the midst of a production run. Without a proper way to auto adjust the batch quantities on consumption there is a huge risk of constantly dealing with wrong quantities and loss of batches / product re-class during testing. Microsoft Dynamics 365 for Finance and Operations offers comprehensive functionality to address such complex processes within process industries. The system gives the user the ability to specify different values in order to adjust the quantities on all the ingredients during the batch run. The system allows you to maintain the base potency / concentration of the active ingredient and a tolerance for allowed deviation. The system would adjust the quantity to a higher value for a lower potency batch that is picked and in turn adjust the compensating ingredient to the percent factor that is setup on the compensating principle of the compensating ingredient. Using Batch Balancing during the production run, the system now determines the quantities required for each ingredient in order to yield the same results. The compensating principle within the Batch Balancing functionality in Microsoft Dynamics provides the necessary means to adjust ingredient quantities based on batch attributes to facilitate the right potency. The production job is prioritized and the production process should include a printed raw material picklist that displays the allocated lot numbers on the worksheet avoiding the possibility of accidentally picking the wrong batch. An additional restriction in place through a scanning solution that scans the lot number from the worksheet that is supposed to be consumed and additionally scan the barcode label on the container that the raw material is in. Label the raw material containers correctly with the lot number in the form of a bar code.